We called it the surgery club. Though none of us wanted it, ¾ of our family underwent surgery that year; I had major shoulder surgery, and just 12 days later my husband had emergency gallbladder surgery. Then, after six bouts of tonsillitis over the summer, our 11 year old daughter got her tonsils out. It felt like we’d never get better. And unbelievably, more surgeries lurked on the horizon. Yet I sensed God urging me to believe that He was still in control and that He heard my prayers. So, in spite of how I felt I kept praying—I chose to believe. Through tears, pain and not understanding, I chose to believe God heard me and was still in control. One of the most essential components to a powerful and effective prayer life is our willingness to believe. Not some utopian, fairy-tale type of belief that mocks reality, but a rock solid, deeply personal, I know the character of Almighty God and nothing is impossible for Him—including dealing with my current reality belief. We must believe that our prayers matter and can make a permanent and eternal difference in our lives and the lives of others, and we must believe that God not only always hears our prayers, but that He is omnipotent and able to accomplish the seemingly impossible. When we believe, we please God (See Hebrews 11:6). When we refuse to cease praying because we believe that God has spoken and will move, our prayers will accomplish greater things than Jesus accomplished (See John 14:12). When we believe, our prayers become rivers of living water that flow out of our innermost being. (See John 7:38). Eventually, thank God, our surgery club closed. And though that year was ridiculously hard, God helped me believe Him anyway. I don’t know what you’re enduring right now, but regardless of the circumstances swirling around you, believe. Believe that God is listening. Believe that He hears you. Believe that He is greater. Believe He is moving in your situation even now. Want some help praying and believing? 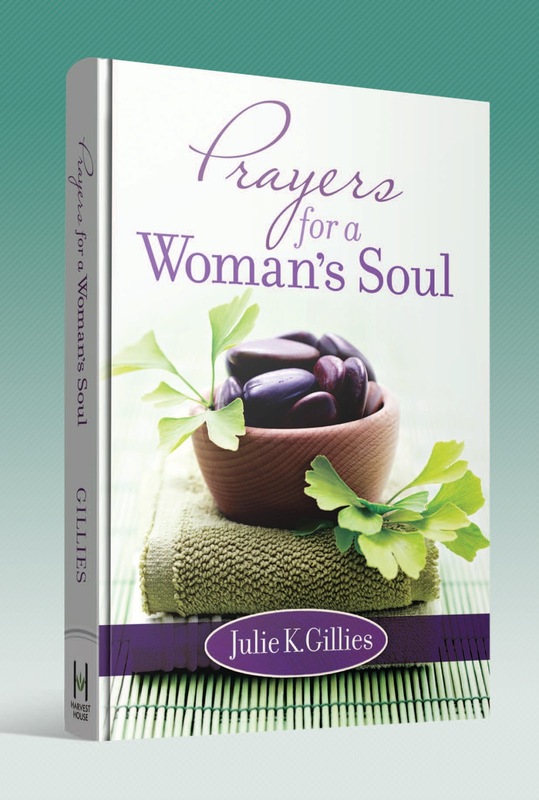 I’m giving away a signed copy of my new book, Prayers For a Woman's Soul to a randomly selected winner. To enter the give-away, please leave a comment (please use your first and last name-or last name initial- if possible, to make winner's announcement more clear) sharing what you are believing God for. If you are reading this via email, please click here to leave a comment. Prize must be claimed by May 21st. Sorry, give-away open to U.S. residents only. The WINNER of last week’s give-away, receiving a signed copy of Prayers For a Woman’s Soul is: Janet (who is leading a group for CBS Bible study). Congratulations! Please send me your mailing address by May 14th. We are believing God that despite what the doctors are telling us, we will be able to have a baby naturally, without any medical intervention. --Jen L.
God is faithful and hears our prayers, trust Him in all circumstances. Though not always easy but as I look back He is always there. We are waiting on an answer from God in our family. I keep praying and keep praying. And I know He hears. I know He will bring about what's best. I am believing God for restoration in my health and provision in my finances. Thank you for today's post, it was just what I needed! For 7 years now we have had on an off illnesses with a loved one .. Our hopes were to move from this house 6 years ago ..and each time we think things have calmed down and it's time to move something happens again. I just keep praying, and believing and knowing that God is in control and his timing for all things is the best. So I work while I wait as I read in a beautiful book several years ago .. Beyond the waiting our family has been ever so blessed and we give all Praise to the Lord Life without him would be ever so meaningless. Awesome post. I'm believing GOD for the blessings and miracles He promises in HIS word. I lived in a victim's mentality all my life until this last 7 months when GOD literally shook my tree and has been pruning out the deadwood. Praise HIM! Thank you, Julie, for allowing GOD to use you. Thank YOU, GOD for using Julie to remind us that YOU'RE omnipotent, El Shaddai. Amen! I'm believing God to release my husband from prison. It's been almost 18 years and this last year has been very difficult and challenging. He is 39. I am also believing God to bring my only son back to The Lord. He gave his life Christ at a young age and we've trained him up in The Lord, so I know God is in him; but it's so hard to see at times. He's 20. Lastly, I'm believing God to continue to heal my body. I had a cutaneous t- cell lymphoma and did not have to undergo chemo. I have discovered a new spot and as much as I know God as a Healer, I get nervous. I am 41. I must have needed this confirmation because my pastor just preached I believe John 20:30-31. And, I do believe. Thank you L Johnson. I am praying for our son who is at a difficult time in his life. I know he believes in God but life sometimes does have some very stressful things for us to go through and I know he is struggling with this. I pray for our sons safety and that he will be able to feel Gods love and know that he is listening to his prayers and does answer them when the time is right. Believing that The Lord will protect, comfort and heal my 16 yr old "bonus" son who is struggling with extreme panic attacks and unable to attend school. Believing the Lord will bless me/hub with better health. Believing Lord's miracles for a relative in dire need. Would LOVE a copy of your new book. I love reading anything that you write and am sure this book will me no exception. I am believing God will give my family guidance and direction as we make a difficult ministry transition. Goodness, so much I am believing Him for in relation to this--I could fill a whole page! I am praying that God will show us where He wants us to relocate. In this prayer we are asking for His will in our work and our ministry. I am also sharing our story and praying for His guidance as I write the words. In all of this my prayer for myself, yes myself is for Him to give me patience and guidance. I BELIEVE that God will turn my daughter around; bring her out of the drug, boyfriend, financial problem she is in and bring her closer to Him --- all in His time! My husband and I are believing God for a new house. A few years ago we were at a Bible study and the teacher told everyone to raise their hands, close their eyes, and tell God what they needed. I told God that we needed a new house and with my eyes closed I saw the corner of a brick house. Since that time several other people have told us that God is "laying the lumber" and "not to give up on the brink of a miracle." We are still believing God for that house and will until it comes to pass. God does not go back on His Word, He said He would do it and He will! Always in HIS timing, not ours! God bless you! I'm believing God for my family to accept Christ as their Lord ans Savior and for my husband to trust the Lord more completely. I'm believing for provision and favor in finances. Well, This is my second try at posting. I don't understand why I have to use some kind of an acct to post. I'm greatly encouraged by the thoughts today, to keep believing, and praying for two wayward sons. I am believing that God is going to take care of our financial needs and my husband's depression. I also believe that God will take care of my adult son who is also depresses, going through a divorce and looking for a job. I believe that God will direct us where He wants our church congragation to relocate to meet and worship and bring those He wants to be there. I am believing God for a job and for my husband's healing (kidney and heart problems). We've been experiencing our own horrible year of severe health problems in my family - my husband, my kids, and me! I'm praying God will turn our hearts toward Him in hope, rather than away from Him in despair! I am believing God is leading us to our home here on earth and the purpose He has for each of us.